Tamsui-Xinyi Line to Guandu station. Take TNUA shuttle bus or Red 35, 55 public bus (MRT Exit 1 on the right). Please refer to the MRT Timetable TNUA shuttle bus routes website. Take no. 216Sub, 223, 302, 308, 550, 682, 821, 864, 1505, s23 to Taipei Municipal Guandu Elementary School stop. After getting off, walk up the hill along the Hseun-yuen Road, which is nearby to a petroleum station. From the intersection of Sec.2, Chongcing N, Road, towards Chowmei Highway. From the intersection of Danshui direction, towards Dadu Road and make right turn at Sec. 4, Zhongyang N. Rd. Turn left at petroleum station on Hseun-yuen Road up the hill. Avoid traffic jam during public holidays at Danshui. 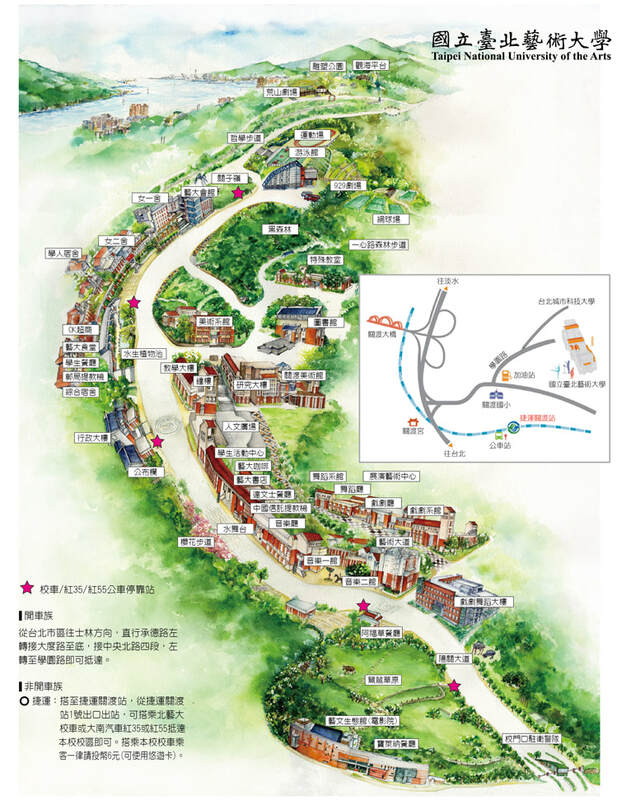 Take the Chowmei Highway towards the intersection of the north Beitou. Take left turn from Daye Rd. at Sec. 3, Zhongyang N. Rd towards Sec. 4, Zhongyang N. Rd and take right turn at the petroleum station to the Hseun-yuen Road up the hill. The TUNA main entrance on the Hseun-yuen Road is open for public vehicles from 7am to 11pm. For vehicles without permit issued by the University or having expired permit, a NT$30 hourly charge will be levied. Motorcycle will be charged for NT$10. Free Parking is allowed for less than 30 minutes. Parking more than 24 hours is prohibited.